Chapter 7). As in the case for the launchers, the primary difference in the weights and thrusts is a result of the carried propellant. The propellant mass for the hypergolic rocket is 27 times greater that for the nuclear electric rocket. The propellant load is reduced by the increasing specific impulse of the propulsion system, and the reduction in mass and thus engine thrust and propellant flow rate. Unlike the space launcher, where the payload is about one-seventh the OEW, for the OMV the payload is greater than the OEW. The OEW differs from empty or dry weight in that all of the fluid lines are assumed filled, and any fluids or propellants trapped there are included in the OEW. The OWE is the OEW plus the payload. That is, it is the vehicle operationally ready but without the propellants loaded. The hypersonic glider for plane change maneuvers is usually a second stage of a TSTO vehicle sized as an automatic OMV, and specifically for plane change maneuvers. 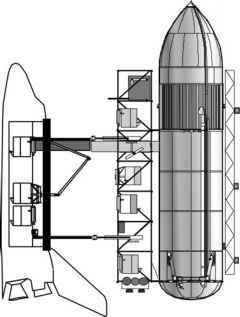 The design payload is 2.268 tons (5,000 lb). With a mass ratio of 1.603 the OMV is sized for a 32-degree plane change capability, the same as the impulse turn OMV. The size and mass characteristics are given in Table 5.11. At Mach 22 the glider has a L/D of 2.70. It is in orbit acting as a plane change orbital maneuver vehicle. An alternate design is shown with a design payload to accommodate the heaviest satellite in Table 5.5, that is, 3,650 kg. The vehicle scales as the square-cube law as the ratio of masses, 1.609, is just slightly greater than the ratio of areas 1.354 raised to the 3/2 power, that is 1.576. As would be expected, the OEW ratio 1.362 scales with the area ratio. Table 5.11. Hypersonic glider (FDL-7 C/D) for 32-degree plane change at 200 km.